Quick Disconnect Gooseneck - Detail Design Inc. When bad weather approaches, rapidly disconnecting from an offshore drilling operation is necessary. One phase of the disconnect process involves removing the choke/kill/hydraulic/mud boost goosenecks from the telescopic joint. 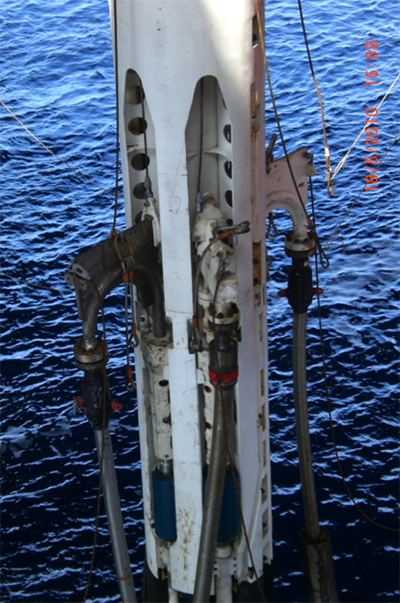 Typical approaches require personnel to be lowered to the joint in bosun chairs and high pressure flanges unbolted, a tedious, dangerous operation often taking 12 to 18 hours. With the DDI patented removable gooseneck system, the disconnect can be completed without personnel intervention in about 2 hours. The entire operation is mechanically achieved, no hydraulics or electronics. Connectors are presently in service for 15M, 7.5M and 5M.